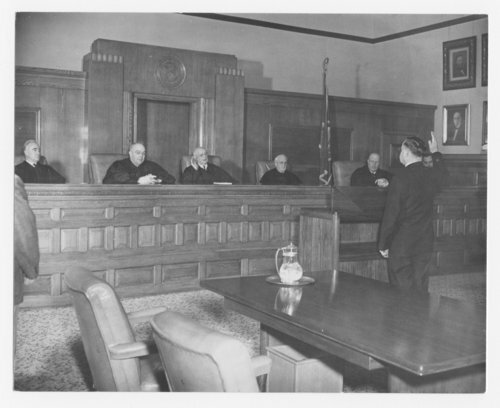 This is a photograph showing members of the Kansas Supreme Court seated in the courtroom. Members of the court are (left to right) Robert T. Price, William Smith, William West Harvey, Walter G. Thiele, Jay Parker, and Edward Arn. At the time this photograph was taken, the Supreme Court was located in the Kansas Capitol in Topeka, Kansas.